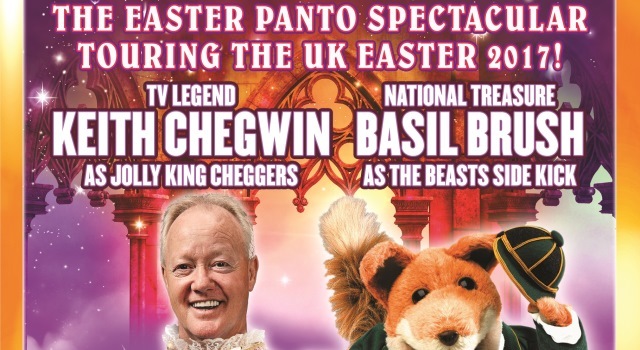 Starring Keith Chegwin as the Jolly King, Basil Brush as the Beast’s hilarious sidekick. Belle lives a quiet provincial life in the village of Ooh La La… until an Evil Enchantress arrives in town. Belle’s father accidentally stumbles across a terrifying Beast and his daughter is taken captive… Now it is up to Jolly King Cheggers, the village idiot Wally, Dame Dolly Doolittle and the mysterious Fairy Tale to save the day and unlock the Beast’s magical secret. Starring Keith Chegwin as the Jolly King, Basil Brush as the Beast’s hilarious sidekick and further celebrity casting yet to be announced and supported by a full professional cast, live musicians and local juvenile dancers… prepare yourself for an all-singing, all-dancing, laugh a minute ride through the fun and frolics of panto land - arriving Easter 2017!